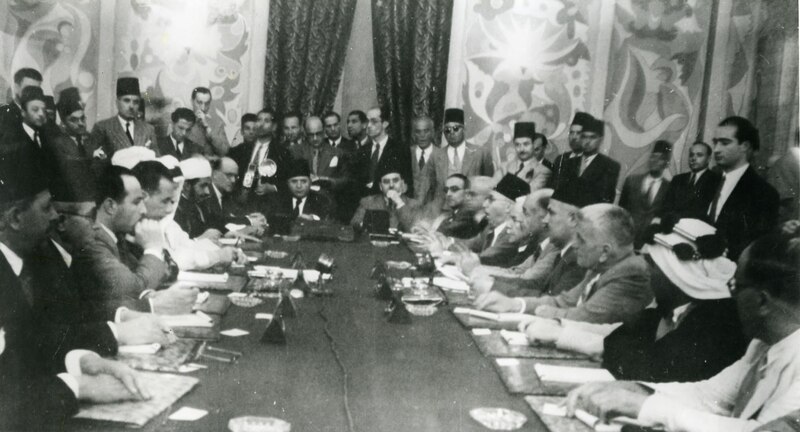 Arab League members seated from left: Mahmoud el Nokrashy and Mohammad Hussein Haikal (Egypt), Fawzi al Mulki (Jordan), and Abd al-Rahman Azzam (Arab League). In the center of the photo, from right to left, Saeb Salam, Philippe Takla, Saadi al Munla (Lebanon), Jamil Mardam Bey, Faris El Khouri and Saadallah al Jabiri (Syria). Standing to the leftmost is Ahmad al-Shuqairi.